Extreme high quality fibreglass front storage box to fit to the A-frame on trailer tents and older caravans without gas lockers. Carry gas bottle, awning groundsheet, pegs, winding handle or any other gear you want close to hand and easily accessible when you arrive on site. 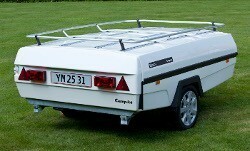 Optional 2 or 4 bike carrier fits to the integrated roof rails on 5th generation Camp-let trailer tents. Kits are complete with cross bars, bike mounting ski, bike frame clamp and arm and wheel securing straps. Side and front wall adds shade, breeze blocking and shelter to the Camp-let Standard Sun Canopy. The front is a half-height / windbreak style wall and the side is full height with a large window allowing viewing out while providing shelter and can be fitted to the right or left side of the canopy. Full height side wall to fit the Camp-let Acrylic Sun Canopy adding shelter and shade with large window panels. Available in blue/grey colour scheme to match both the Camp-let Premium and Royal Acrylic. Pair of foam mats to fit under the mattresses and inner to provide extra insulation for those that feel the cold or camp in winter. Fits to all Camp-let models. 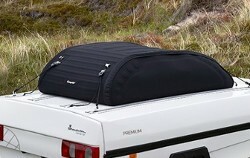 Be able to take more luggage on your holidays without filling up the car with a lightweight roof bag. The Roof Bag is attached to the lid of the Camp-let - either on the 4th Generation roof rack or on the 5th Generation aluminium tracks with a set of lashing eyes. 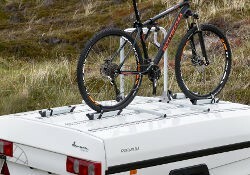 Optional aluminium luggage rack provides mounting space for heavy or bulky items as an alternative to a car roof rack. Fits to the integral roof rails on all 5th generation Camp-lets. Stylish bench seat cover for Camp-let trailer tents. UK made cover protects seat cushions and keeps them clean. Fits all Camp-let models. Zip on side annexe fits in place of the left hand awning side panel on the awning of your Camp-let Acrylic trailer tent adding valuable bedroom space, storage area or toilet annexe. Zip on side annexe fits in place of the left hand awning side panel on the Camp-let Adventure trailer tent adding valuable bedroom space, storage area or toilet annexe. Zip on side annexe fits in place of the left hand awning side panel on the Camp-let Classic trailer tent adding valuable bedroom space, storage area or toilet annexe. Zip on side annexe fits in place of the left hand awning side panel on the Royal Cotton trailer tent adding valuable bedroom space, storage area or toilet annexe. 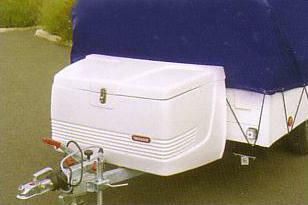 Easy to fit side storage bracket to fit all models of Camp-let trailer tent on 5th generation trailer. Mobile side store allows trailer to be moved once on its side. Slatted bed kit to go under the mattress and inner tent on Camp-let trailer tents leaving an air gap and improving comfort, insulation and breathability. Options available for both right and left hand bed. Large zip-on sun canopy in Isabella cotton canvas for the Camp-let Royal trailer tents. 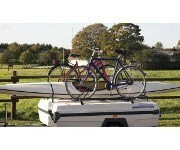 Available in blue/grey and grey/salmon colour options to match trailers from 2004 to 2011. Large zip-on sun canopy in Isabella cotton canvas for the Camp-let Adventure trailer tent in Mocha/Blue colour scheme to match the awning canvas.